I love soup. Oh, I do. And I wish I loved all the broth-and- vegetable- only combination the most. But no. My favorite soups are creamy and thick, Cream of Mushroom at the top of the list. But I have good news for you. My most recent culinary foray is into the world of soups. My mission is to create the same soups I love but in much healthier format. Most cream based soups involve a lot of butter, a lot of cream, and then some more butter and cream. But I have made multiple soups in the past two weeks that pack all the thick and creamy you need and are super healthy. Here is my new favorite to share with you. From my kitchen to yours, enjoy every bite. In a medium pot over medium heat, melt 1 tablespoon of butter. Chop two garlic cloves and ½ of a small shallot. Add to the pot stirring several times. Allow the heat to sweat the aromatics for several minutes. Add your mushrooms and stir. Saute until mushrooms begin to expel liquid and darken in color. At this point I added about 2 teaspoons of white pepper (it adds a LOT of kick so if kick is not your thing, add it in smaller increments) and a teaspoon of ground thyme. If you do not have white pepper or thyme, use smaller amounts of ground pepper, salt and other seasonings you like. If you want some great ideas about pairing flavors and food, I got the most amazing book for Christmas: The Flavor Bible. You can blend the soup completely to be perfectly smooth or you can puree only a portion to give it a smooth texture but still great pieces of mushroom. Top with croutons or crostini. I also used a drizzle of white truffle oil. Delicious. I love soup too - but pretty much only cream based soups (healthy, right)? My favorite right now is baked potato soup from Cooking Light. Easy recipe, less calories! Yum! You do like to cook, don't you? and everything you make looks so good! Cream of mushroom is some of my favorite. This sounds great! 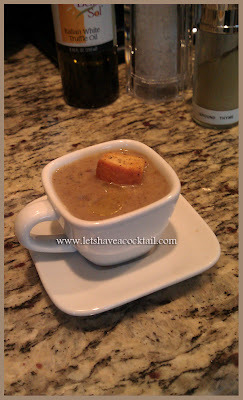 I tried to find a good mushroom soup a couple of years ago and newer found one that I really liked. Will give it a try - maybe tomorrow. By chance, I bought mushrooms today! Happy weekend. That sound like a great recipe! My favorite is Buca di Beppo's 'Italian Wedding Soup'. I think they have a location in Alpharetta if you are around Georgia. I love cream of broccoli soup but I never eat the veggie. Go figure. This one is on my blog this week Jenny Mac! Thanks!!!! Yummy! and what perfect timing when we are about to get hit with another snow storm with the possibility of being stuck inside again. Mmmm. Good for you. Soup. Oh my! I just raced to the grocery store this afternoon to buy fresh mushrooms and a shallot. It was worth the trip! The perfect thing to bring me back to life after that run...I was even nice enough to share with my neighbor, as I borrowed her immersion blender to complete...Added bonus, yoummy soup for lunch tomorrow!! THANK YOU, from one soup lover to another! mmmm...that looks delish! i LOVE cream of mushroom soup. and that recipe you have for warm sangria - divine!!! glad i found your blog : ) i'm your newest follower. I love your blog. :) Just made the soup. The 2 tsp white pepper are definitely not for the faint of heart (I might half it next time). Love the flavor of this recipe and will definitely be checking into the Flavor Bible you mentioned. Thanks for posting this!